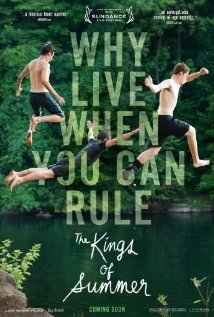 If you can steal some cash from your dad’s wallet, slap together a ragtag shack in the woods and survive on Boston Market chicken all summer long, you may give the boys in Jordan Vogt-Roberts’ coming-of-age comedy, The Kings of Summer, a run for their (ill-gotten) money. Patrick’s (Gabriel Basso) ever-present parents, brilliantly played by the hilarious Megan Mullally and Marc Evan Jackson, are giving him hives. Joe’s (Nick Robinson) cranky dad (Nick Offerman) is miserable and makes Joe so upset he has to call the police during a game of Monopoly. Then there’s Biaggio (Moises Arias). No one really knows why he runs away. It’s a good thing he does, though, because he adds some excellent, quirk-flavored comedy to the film. The trio escapes to the nearby woods for the entire summer where no one (dubiously) is able to find them. Things go great for the boys until a girl comes along. The adolescents have a lot of growing up to do out in the wilderness, but their parents explore some new territory as well. It’s a fun summer flick with lots of opportunities to laugh out loud, and there may even be a lesson or two wedged in between fireside meals and lake swims. Impressively, it’s all done in a manner much tamer than almost anything you can find on MTV. The Kings of Summer is in select cities now.